Rentals at the Epic Center are a great way for every team to improve. Through practicing on realistic sports surfaces, players can develop the necessary touch to succeed. Also, regulation fields provide enough room for drills and scrimmages. Rent our regulation youth soccer field (40 yards by 70 yards), our second open soccer field (85 feet by 185 feet), or our inline hockey rink (85 feet by 185 feet) for all your practice needs. Last, our newly installed field in the Fun Center is approximately 100 feet by 90 feet, and is perfect for small-sided training. Rentals are made on a first come, first serve basis. Space may become limited, so make your rentals in advance. 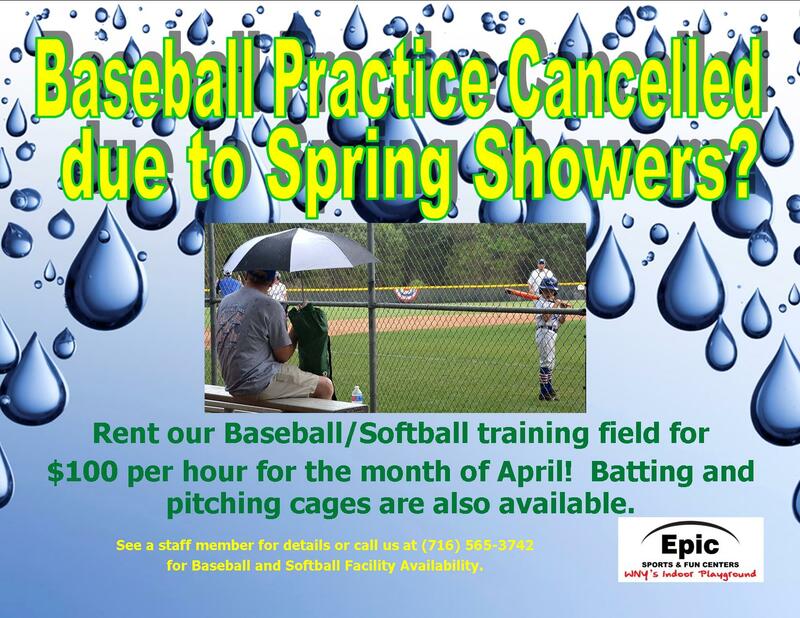 For details, call us at (716) 565-3742 or e-mail us at epicctr@epic-center.com. Spikes and Outdoor footwear are NOT allowed on any of our turf fields. Players wearing such footwear will be pulled from participation. Coaches, please advise your players to wear sneakers/flats/ indoor shoes ONLY. Thank you in advance. Friday and Saturday Night Special (6:00pm - 12:00am): Rent the inline rink for only $140 per hour! *"Current Player Special"-- already play here? Are you currently registered with a Player Pass AND Valid S.O.D.A. Insurance? Fee is $100 per hour. Bonus-- no one from your group needs to be a current registered player...As long as the individual signing up for the rental is a current player, you're good to go! Call us today for availability!